Classic Shell • View topic - [REQUEST] Midnight skin for Classic with two columns. Post subject: [REQUEST] Midnight skin for Classic with two columns. I really like the Midnight skin for the Windows 7 style, though I prefer to use Classic with two columns start menu. Does a Midnight skin exist for Classic with two columns start menu? If so, can someone link me to the skin. If it doesn't exist, would a skin guru be interested in creating one for Classic with two columns? Post subject: Re: [REQUEST] Midnight skin for Classic with two columns. The closest you can get is the Smoked Glass skin. Thanks for the fast reply. I just want the same color scheme as Midnight. 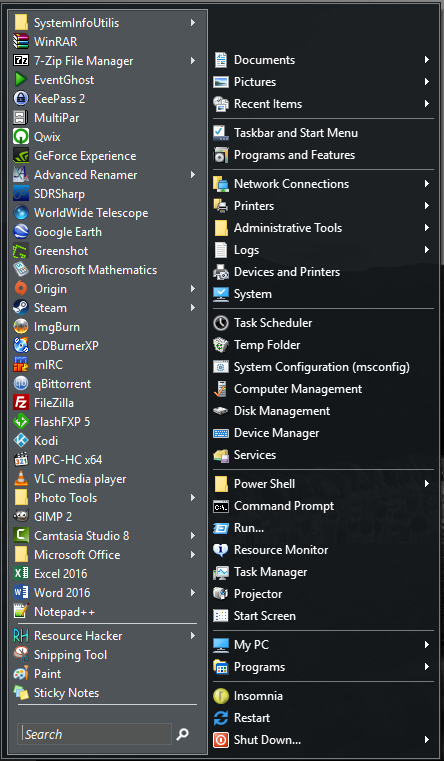 Is there some limitation with the Classic with two columns start menu that wont allow the same color scheme as the Midnight skin? There are other skins that come close, but not an exact match to the Midnight skin. No, no reason. Somebody with free time on their hands can make a version of the Midnight skin for the Classic styles. The Midnight skin was initially developed because the Windows 7 style was lacking a dark-colored skin. It is relatively recent and was influenced by the sharp edges of Windows 8. I tired, but failed miserably. So I figured I'd post a request here, and maybe someone with skinning knowledge could piece the color scheme together for a Midnight in the Classic menu. Much appreciated to anyone that wants to create Midnight for the Classic Menu. Actually, the .skin7 file works pretty much fine as a Classic with 2 Columns style skin, if you copy it and rename the copy to "Midnight.skin" ._. Thanks for the tip. That actually works quite well. I just have to figure out the border around the search box. Other than that, it seems to work quiet well. @trembo, why do you prefer the Classic with two columns style? Any particular reason? I don't like how All Programs display in the Windows 7 style. I prefer a sub-menu showing all my programs in a multi-column, rather than having to scroll a small search box to see my programs. Plus, I like having icons appear next to my system command shortcuts in the right column. Having to hover over a command link, and the icon appear above is pointless. It might be nice for aesthetics and a minimalist look, though I prefer ease and quick navigation over minimalism. I guess I could customize the Windows 7 style to do what I have customized in the Classic Style, though what's the point, since I already have it configured for the Classic style. 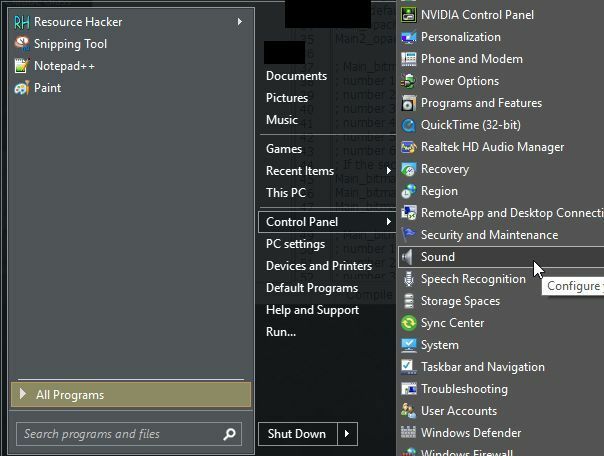 I'm just curious, is there any reason, such as specific added features I'm missing out on by using the Classic Style instead of the Windows 7 Style? The Windows 7 style also allows for a multi-column All Programs menu. Select the option "Cascading sub-menu" under "All Programs style" on the Main Menu tab. An advantage of the Windows 7 style is that it lists search results from top to bottom so they don't jump/change position as more results appear. Also, it has an option to open All programs automatically if you are using the compact treeview. ...is there a way to do the reverse? ._. The Windows 7 skins has requirements for the layout of the menu, which makes it incompatible with the classic style. You can place the Programs menu or the search box anywhere in the menu, even in a sub-menu if you want. The all programs tree can't work in those cases. No, not possible. The way Windows 7 style works does not leave room for showing the user name. You can already show or hide the user picture in Windows 7 style. It's skins have their own column width settings, called "Programs pane width", "Jumplist pane width" and "Sub-menu width". The width of the right column in the main menu is determined by how long the text label is.